Inspired by my friend Gunnar Peterson, I've committed to begin funding Kiva Micro-loans in the next 30 days with a goal to fund up to $1,000 by year end. What does Kiva do and what is a micro-loan? Kiva is the world's first person-to-person micro-lending website, empowering individuals to lend directly to unique entrepreneurs in the developing world. The people you see on Kiva's site are real individuals in need of funding - not marketing material. When you browse entrepreneurs' profiles on the site, choose someone to lend to, and then make a loan, you are helping a real person make great strides towards economic independence and improve life for themselves, their family, and their community. Throughout the course of the loan (usually 6-12 months), you can receive email journal updates and track repayments. Then, when you get your loan money back, you can relend to someone else in need. About a year ago, we signed up for Kiva, which is a microlender. One of our first loans went to Sith Saron, who lives in Siem Reap Province in Cambodia. She needed a $1,000 for a cow, seeds, and a motorcycle for her farm. Sith Saron is 37 years old and the mother of 7 children. She sells Khmer traditional cakes such as Num Korm, Num Bot, and Num Krouk to the people in her community and usually earns up to $4 each day. Her husband, meanwhile, works in his rice paddy growing crops as well as several kinds of vegetables. Two of her children are employed at a hotel, but the others are students. If you are interested in helping me -- and thus others -- with contributing to the micro-loan movement, either sign-up to donate directly yourself, or feel free to donate via gift certificate to my pool and we can make an even bigger difference! At my birthday BBQ bash this weekend, in lieu of gifts I've asked for folks to donate to my pool for this year to fund multiple loans. My family of three young girls and my lovely wife are all very excited about being able to participate in this process both domestically and internationally. 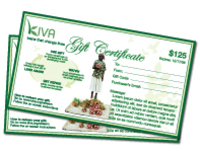 In fact, all three of my kids are invested in giving up material goods and gifts in exchange for donations to Kiva. How cool is that? Thanks to Gunnar again for the motivation and Thomas Barnett for his inspiring words. Update: Within 3 minutes of posting this, my bud Zach already donated! Fantastic!